A former prison complex in East Berlin that was run by the GDR's secret police, the Stasi, as one of their main remand prisons, primarily for political 'offenders'. Today it is a memorial site and the preserved prison complex can be visited on guided tours (the German tours usually conducted by former inmates!) – and these are one of the most captivating items on Berlin's rich dark-tourism menu! Highly recommended. In addition a relatively new permanent exhibition about the prison, the Stasi and the GDR judiciary and treatment of political dissidents complements the memorial. More background info: Originally, parts of the premises at Hohenschönhausen were used by the Soviet occupiers after WWII as a detention centre for incarcerating suspected Nazis and (increasingly) suspected opponents of the occupying regime. Many were sent from here to the Soviet gulags. The place continued to serve as a remand prison for the Soviets until shortly after the founding of the GDR when the GDR's state security service, the Stasi, took over, later expanding the complex by adding a completely new prison by the early 1960s. 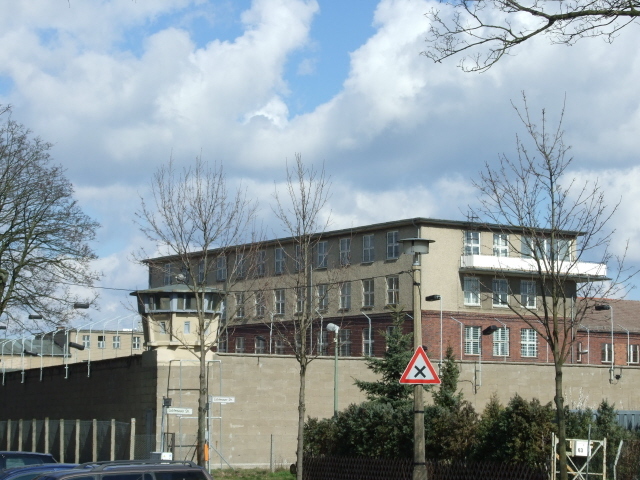 Hohenschönhausen became the HQ for the Stasi prison system. All its other remand prisons were administered from here (cf. Bautzener Straße). In addition there were workshops (e.g. 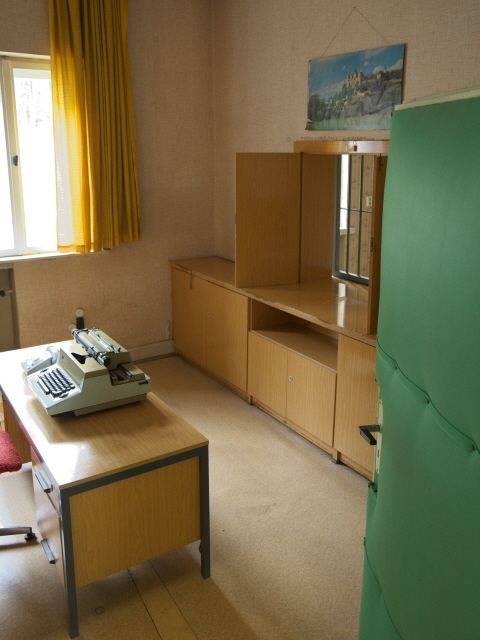 for making spying equipment and document forgery) and residential blocks of flats for the Stasi staff. The whole district was closed to the general public and access restricted only to authorized Stasi members. On city maps it was usually disguised or left blank. 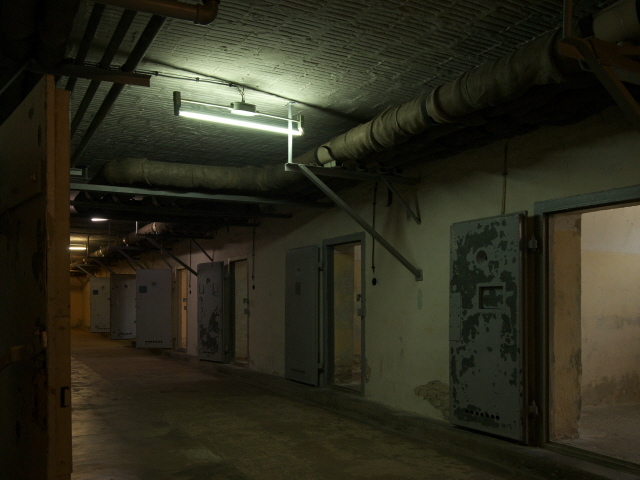 (In fact many ex-Stasi members still live in this district – and apparently some occasionally try to disrupt the running of today's memorial at the old prison; see also under access below). 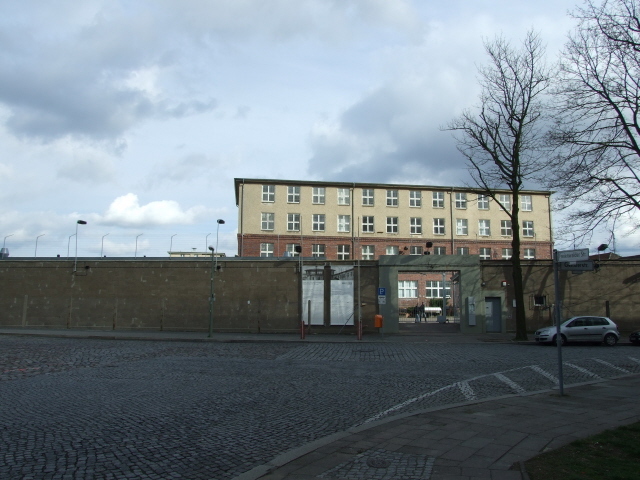 After the fall of the Berlin Wall, the collapse of the communist regime, and the subsequent reunification of Germany, the prison was closed in October 1990 and has been preserved virtually unchanged to this day. The prison memorial site at Hohenschönhausen allows unique insights into the inner workings of the Stasi system. What really distinguishes it from a mere museum is the fact that the German-language guided tours are (usually) conducted by former prisoners, who have their very own personal stories to tell about why they had been brought here and what their experiences were. This really brings the site to life, as it were, as you are guided through various former tracts of cells and interrogation chambers and the like, pretty much in the order that the inmates would have passed though them. Naturally, not all inmates had exactly the same experiences, and thus the guided tours will vary in that respect according to who conducts the tour. In 2013, an additional permanant museum exhibition was opened in the oldest prison block. What there is to see – and hear: This is really two or three sites in one. On the one hand there is the former prison itself, which has been largely preserved in the state it was in at the end of the GDR era. Then there is the more recently added exhibition. As you walk in you pass through an oblong room that contains only small boxes along the wall with mugshots of individual former prisoners. 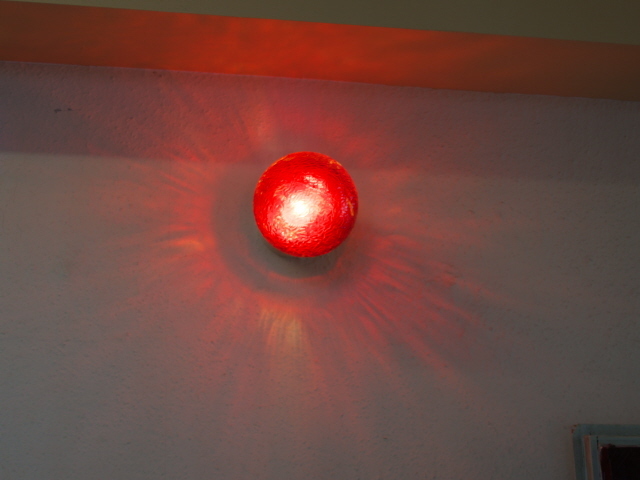 These light up in a random order while an audio track plays selected quotes from interviews with these ex-prisoners. All this is obviously in German. The actual exhibition as such, on the other hand, is bilingual, in German and English. The translations are more or less fine, except that they literally take over the present tense use for past events, which is customary in this genre in German, but doesn't work the same way in English (so it takes a little getting used to). In addition you can use a free audio guide, which is especially useful if your preferred language is one of those other than German or English provided by these machines (see under access & costs). The exhibition occupies one large room and a couple of smaller side rooms. It is pretty tightly packed with artefacts, information panels and screens. In addition to the static exhibits there are also about a hundred interactive 'media stations' playing, for instance, video interviews with former inmates/victims of repression. Thematically the exhibition covers everything from the initial use of the prison as a special camp by the Soviet occupying forces after WWII to the end of the GDR and its aftermath. 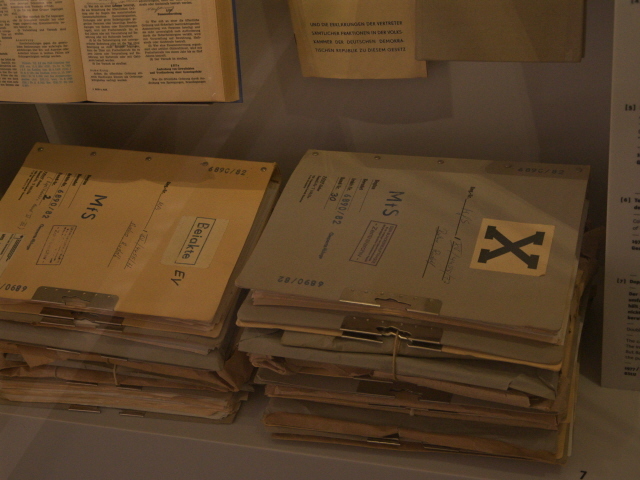 There are many original artefacts on display, ranging from prison guard uniforms and handcuffs to different types of cell doors, a straightjacket and spying technology used by the Stasi, such as a machine that allowed the secret opening of letters or a set of the infamous 'scent samples' (pieces of cloth victims sat on during interrogation and which were later archived for potential use later by sniffer dogs – see also Stasi Museum). Some rooms of the prison administrators' offices can also be seen. The exhibition is organized in part chronologically, in part thematically, including: the place itself, experiences of inmates, political resistance and oppression, the world of the perpetrators. You can explore this museum part of Hohenschönhausen freely, at your own pace, to whatever depth you like. However, to see the extensive prison complex itself, you cannot just walk around on your own but must go on a guided tour. 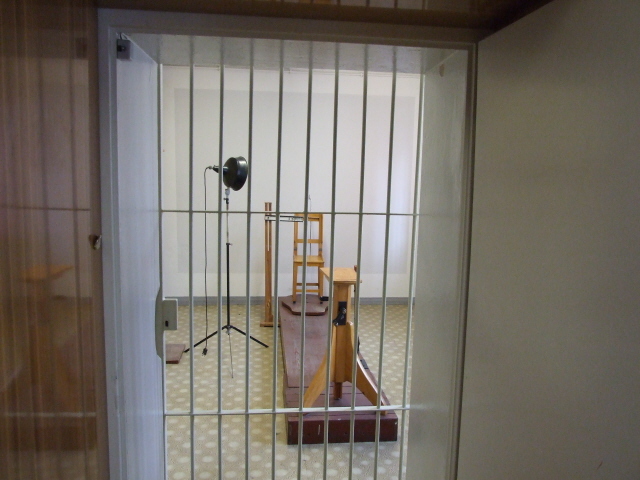 These tours are preceded by a short film introduction about political persecution in the GDR in general and the history of the Hohenschönhausen prison in particular. Then guides, usually former inmates (on the German-language tours), take groups round the site. I went twice, first in 2008, and again in the summer of 2016, that time on an English tour. I'll describe the German one first, then comment on what was different on the English one I took more recently. An early stop on the tour is the garage where the victims arrived in vans after they had been captured or arrested. That way they never saw the outside of the site and usually had no idea where they were. You can look inside the tiny prisoner cell inside the van too. A particularly gruesome stop is at the former 'U-boat', a set of damp and dark isolation cells in the cellar of the oldest building of the Hohenschönhausen complex. This was used primarily in the early Soviet phases of the prison. 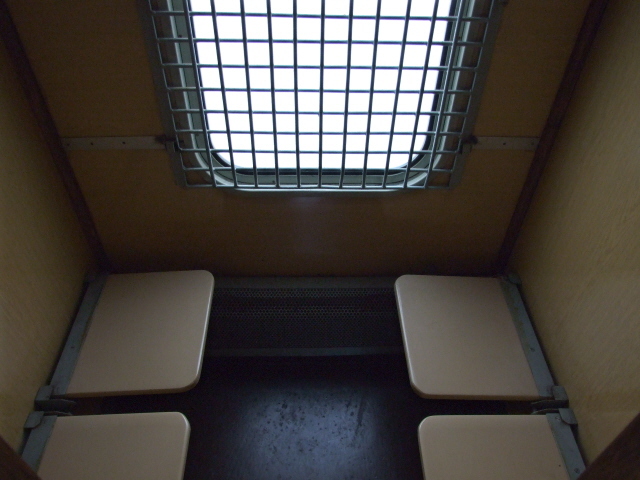 One cell is a padded cell – set aside for “unruly” inmates to “calm down” in. There's also a 'standing cell', where prisoners had to wait in a maximally confined space, completely unable to move, and not knowing how long they'd have to spend there. The method was anything but new – and had, for instance, been used in the Nazi concentration camps as a regular form of punishment and intimidation too. The tour then moves on to the newer prison complex. 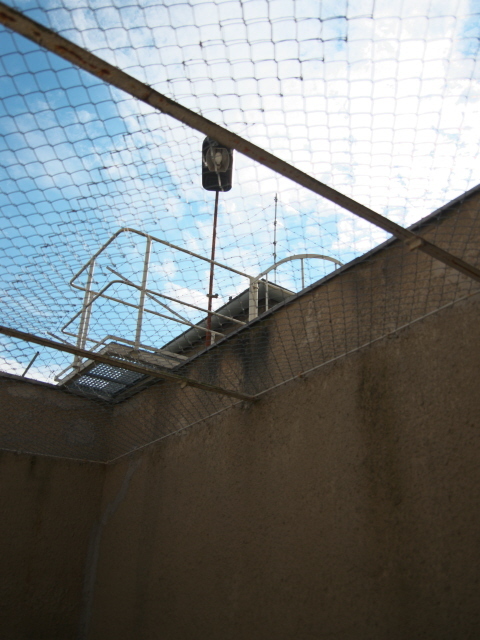 Here all stages that the prisoners went through can be seen, from arrival and registration, interrogation, living cells and the so-called 'tiger cages' where the inmates were allowed a bit of fresh air – but no view other than a bit of sky through the wire roofs above the high walls of these very small, hardly 'open' spaces. 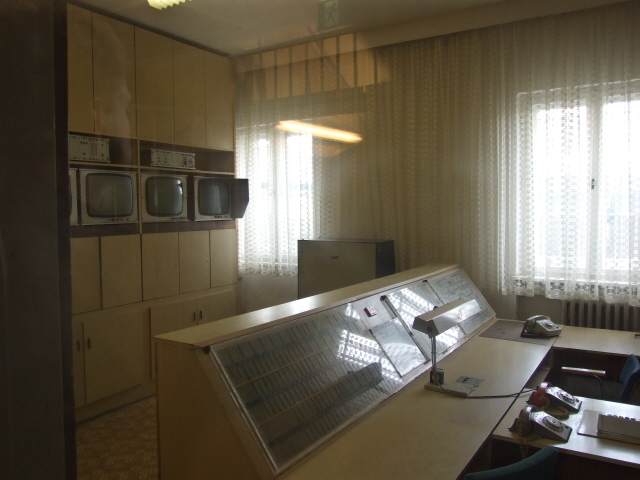 You also get to see the surveillance technology used, and one room still has one of those portraits of head of state and party chairman Erich Honecker on the wall. All official rooms would have had such a photograph of the big man on a wall during his days – something that is/was common in most such dictatorships, even though in Honecker's case such standardized cult of personality attempts had always seemed a bit feeble, not helped by the man's rather 'harmless' look, which thus never came anywhere near to the menacing effect this had in the case of, say, Stalin, or North Korea's Kim Il Sung. 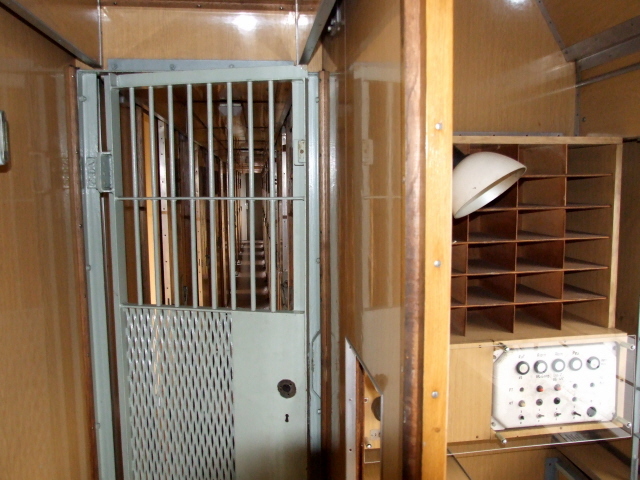 Only on tours on Thursdays at 1 p.m. there's an added extra: namely a chance to see the inside of the so-called Grotewohl Express ... so named after the GDR's first prime minister. 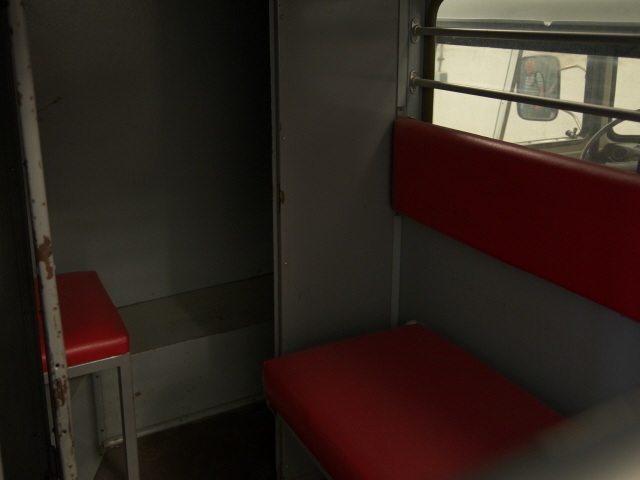 It's a railway carriage used by the Stasi for transporting prisoners between different sites. The minute 4-person cells inside are at least as oppressive as the ones in the actual prison itself. Other than that all tours show you the same rooms and objects – but the personal stories the guides have to tell naturally vary. It depends who you get as a guide. When I visited in late March 2008 I felt lucky in that respect. To be fair to the other guides I won't give away the name of that particular guide here, but will only comment this much: the man left you with the impression that he was a truly remarkable character – not just in the way he reported his own story (often quoting from his own files that the Stasi had put together). Also in the way he dealt with his fate afterwards. After the collapse of the GDR he actually approached some of his former guards, interrogators and others who had been on "the other side". Not out of revenge or even bitterness, without pressure, but just openly, out of genuine interest in that "other side". That way he left the space for one of the former Stasi-agents that had interrogated him to manage to express something like an apology towards his former prisoner ... and that's always been something extremely rare ever to come from ex-Stasi people after the demise of GDR. When I went back to Hohenschönhausen in the summer of 2016 I opted for an English-language tour. This was led by an American student of history. It basically followed exactly the same circuit as the German-language tours and covered the same thematic aspects. While the guide was very pleasant and knowledgeable and her narration expertly delivered, what such a tour naturally lacks is the element of a genuine “Zeitzeuge” ('eye witness'), the added value of hearing their personal stories first-hand. On the other hand, the English-language guides can report aspects of various different inmates' stories, so that's a bit of a trade-off. A visit to the Hohenschönhausen complex should also include a good browse in the excellent museum shop – they stock an amazing range of books and films, etc. on the topic of the Stasi and related special interests. It's one of the best such museums shops I've ever seen – very dangerous for one's wallet. While the majority of the books on offer are in German, there's also an impressive selection in English. Outside the prison walls, especially along the approach road (Freienwalder Straße) from the main road where the tram line is, there are several information panels (also bilingual – German and English) about some of the ancillary structures of the formerly restricted-access district of Hohenschönhausen, such as the outer checkpoint and gate or the workshop where spying technology for the Stasi used to be manufactured. All in all, Hohenschönhausen retains its status as one of the most impressive of Berlin's many dark tourist attractions and provides the best insight into the darkest aspects of GDR history. A true must-see! Location: in the east of Berlin, in the district of Lichtenberg, at Genslerstraße 66. Access and costs: Off the beaten tourist track, but not too tricky to get to; by guided tour only, but very moderately priced. Details: It's a bit far out, but still fairly easy to reach by public transport plus a short walk – either from the bus stop (Line 256) 'Genslerstraße' (connecting from/to Lichtenberg, U5, S5, S7, near the Stasi Museum) and then walk along that street northwards until you get to the gate to the memorial site (you can't miss it – you'll see the watchtowers and walls with barbed wire on top!). Or get to the tram stop 'Freienwalder Straße' (Line M5 – connecting to/from Alexanderplatz), then walk to the end of that street, which branches off eastwards from Große-Leege-Straße. The permanant exhibition is open daily between 9 a.m. and 2 p.m.; admission free. You can borrow free audio-guise as well (in German, English, French, Spanish, Italian, Danish and Russian). Access to the actual prison is by guided tour only. You can just turn up and join one of the regularly conducted tours for individuals. Groups, on the other hand, have to register in advance. Tour times: English-language tours take place daily between March and October at 10:30 a.m., 12:30 and 2:30 p.m. – in winter only at 2:30 p.m. and at weekends also at 11:30 a.m. But if you have a decent enough grasp of German you get a somewhat wider choice: German-language tours start hourly from 10 a.m. up to 4 p.m. between March and October. In winter weekdays guided tours take place at 11 a.m., 1 p.m. and 3 p.m. They now also offer tours in Russian, but only on Sundays at 2 p.m. The regular adult charge is a mere 6 EUR (a bargain! ); some concessions apply. Closed over Christmas and on New Year's Day. Time required: The exhibition alone can take up between 45 minutes and maybe up to two hours (if you want to take in all the audiovisual elements). The guided tours of the prison last about 90 minutes. Add a bit of extra time for a post-tour chat and a bit for the bookshop too perhaps – and of course for getting there. Combinations with other dark destinations: in general see Berlin – Both thematically and with regard to location, the most obvious combination will be that with the Stasi Museum at Normannenstraße (bus 256 connects the Hohenschönhausen memorial site with Lichtenberg station, from where it's either a 15-minute walk or short metro or bus ride to the museum). The immediate vicinity of the Hohenschönhausen site doesn't offer anything else for the dark tourist. Thematically, you may want to compare the sombre approach of both Hohenschönhausen and the Stasi Museum with the comparatively light-hearted and playful approach at the GDR-Museum in Berlin Mitte or the Life in the GDR exhibition in Prenzlauer Berg. Combinations with non-dark destinations: Nothing in the environs of the Hohenschönhausen memorial site. Otherwise see Berlin in general.